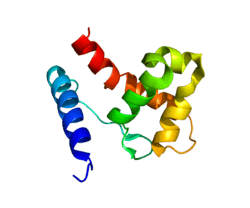 Lysine-specific demethylase 5A is an enzyme that in humans is encoded by the KDM5A gene. The protein encoded by this gene is a ubiquitously expressed nuclear protein. It binds directly, with several other proteins, to retinoblastoma protein which regulates cell proliferation. It was formally known as Retinoblastoma Binding Protein 2 (RBP2). This protein also interacts with rhombotin-2 which functions distinctly in erythropoiesis and in T-cell leukemogenesis. Rhombotin-2 is thought to either directly affect the activity of the encoded protein or may indirectly modulate the functions of the retinoblastoma protein by binding to this protein. Alternatively spliced transcript variants encoding distinct isoforms have been found for this gene. The Drosophila homolog, LID, was found to be an H3K4 histone demethylase that binds to c-Myc. It was recently renamed to Lysine Demethylase 5A (KDM5A). JARID1A has been shown to interact with Estrogen receptor alpha, LMO2 and Retinoblastoma protein. JARID1A is a major component of the circadian clock, the upregulation of which at the end of the sleep phase blocks HDAC1 activity. Blocking HDAC1 activity results in an upregulation of CLOCK and BMAL1 and consequent upregulation of PER proteins. The PSF (polypyrimidine tract-binding protein-associated splicing factor) within the PER complex recruits SIN3A, a scaffold for assembly of transcriptional inhibitory complexes and rhythmically delivers histone deacetylases to the Per1 promoter, which repress Per1 transcription. Knockdown of JARID1A promoted osteogenic differentiation of human adipose-derived stromal cells in vitro and in vivo and resulted in marked increases of mRNA expression of osteogenesis-associated genes such as alkaline phosphatase (ALP), osteocalcin (OC), and osterix (OSX). RBP2 was shown to occupy the promoters of OSX and OC to maintain the level of the H3K4me3 mark by chromatin immunoprecipitation assays. RBP2 was also physically and functionally associated with RUNX2, an essential transcription factor that governed osteoblastic differentiation. RUNX2 knockdown impaired the repressive activity of RBP2 in osteogenic differentiation of human adipose-derived stromal cells. 1 2 "Entrez Gene: JARID1A jumonji, AT rich interactive domain 1A". ↑ Secombe J, Li L, Carlos L, Eisenman RN (Mar 2007). "The Trithorax group protein Lid is a trimethyl histone H3K4 demethylase required for dMyc-induced cell growth". Genes & Development. 21 (5): 537–51. doi:10.1101/gad.1523007. PMC 1820896 . PMID 17311883. 1 2 Chan SW, Hong W (Jul 2001). "Retinoblastoma-binding protein 2 (Rbp2) potentiates nuclear hormone receptor-mediated transcription". The Journal of Biological Chemistry. 276 (30): 28402–12. doi:10.1074/jbc.M100313200. PMID 11358960. ↑ Mao S, Neale GA, Goorha RM (Apr 1997). "T-cell oncogene rhombotin-2 interacts with retinoblastoma-binding protein 2". Oncogene. 14 (13): 1531–9. doi:10.1038/sj.onc.1200988. PMID 9129143. ↑ Kim YW, Otterson GA, Kratzke RA, Coxon AB, Kaye FJ (Nov 1994). "Differential specificity for binding of retinoblastoma binding protein 2 to RB, p107, and TATA-binding protein". Molecular and Cellular Biology. 14 (11): 7256–64. doi:10.1128/mcb.14.11.7256. PMC 359260 . PMID 7935440. ↑ DiTacchio L, Le HD, Vollmers C, Hatori M, Witcher M, Secombe J, Panda S (2011). "Histone lysine demethylase JARID1a activates CLOCK-BMAL1 and influences the circadian clock". Science. 333 (6051): 1881–5. doi:10.1126/science.1206022. PMC 3204309 . PMID 21960634. ↑ Duong HA, Robles MS, Knutti D, Weitz CJ (2011). "A molecular mechanism for circadian clock negative feedback". Science. 332 (6036): 1436–9. doi:10.1126/science.1196766. PMC 3859310 . PMID 21680841. ↑ Ge W, Shi L, Zhou Y, Liu Y, Ma GE, Jiang Y, Xu Y, Zhang X, Feng H (2011). "Inhibition of osteogenic differentiation of human adipose-derived stromal cells by retinoblastoma binding protein 2 repression of RUNX2-activated transcription". Stem Cells (Dayton, Ohio). 29 (7): 1112–25. doi:10.1002/stem.663. PMID 21604327. Baens M, Aerssens J, van Zand K, Van den Berghe H, Marynen P (Sep 1995). "Isolation and regional assignment of human chromosome 12p cDNAs". Genomics. 29 (1): 44–52. doi:10.1006/geno.1995.1213. PMID 8530100. Mao S, Neale GA, Goorha RM (Apr 1997). "T-cell oncogene rhombotin-2 interacts with retinoblastoma-binding protein 2". Oncogene. 14 (13): 1531–9. doi:10.1038/sj.onc.1200988. PMID 9129143. Chan SW, Hong W (Jul 2001). "Retinoblastoma-binding protein 2 (Rbp2) potentiates nuclear hormone receptor-mediated transcription". The Journal of Biological Chemistry. 276 (30): 28402–12. doi:10.1074/jbc.M100313200. PMID 11358960. Benevolenskaya EV, Murray HL, Branton P, Young RA, Kaelin WG (Jun 2005). "Binding of pRB to the PHD protein RBP2 promotes cellular differentiation". Molecular Cell. 18 (6): 623–35. doi:10.1016/j.molcel.2005.05.012. PMID 15949438. Roesch A, Becker B, Schneider-Brachert W, Hagen I, Landthaler M, Vogt T (Aug 2006). "Re-expression of the retinoblastoma-binding protein 2-homolog 1 reveals tumor-suppressive functions in highly metastatic melanoma cells". The Journal of Investigative Dermatology. 126 (8): 1850–9. doi:10.1038/sj.jid.5700324. PMID 16645588.